Marco and Waterloo Tea at TEDGlobal - Guest author: Kasim Ali - Marco Beverage Systems Ltd. I hope this morning finds you well and happy. So we recently provided the tea and coffee making equipment for TEDGlobal where the guys at Ristretto Coffee and Waterloo Tea used our Uber Boilers, Filtro Shuttles and Water Boilers to deliver the very highest standard of coffee. Rather than us warbling on about it we thought it might be an idea to invite the man who made the tea happen to write about it for us. So ladies and gentlemen, all the way from Waterloo Tea (via the magical internet highway) please give it up for Mr. Kasim Ali! Upon being asked to supply the teas to the prestigious TED event in Edinburgh, we had to make a few key decisions. These centred on the tea menu to serve, what to serve in and how to brew the teas. Our objective was to have a broad span of teas that would introduce a discerning audience to the world of tea. It quickly became obvious that our menu should include Two Blacks (Chinese and Indian), Two Greens (Chinese and Japanese), One White, One Oolong, One Rooibos and an Infusion. Each had a unique flavour when compared against the others, and acted as a representation of that style of tea (or more accurately put – the processing method used to create the tea). Moving on, another stipulation was to be able to brew quickly and accurately. This was because the service would be stop/start with delegates watching the talks and then approaching us en masse during the breaks. This left the issue of hot water delivery systems. The different teas on offer required different temperature water to brew them. In the tea world this is the holy grail. Just to highlight this point – Japanese teas brew at around 65oC, whereas black teas are brewed at 95oC. We had recently worked with Marco at the SCAE event in Vienna. The set up that Marco had suggested for that event was two uber fonts each with two eco boilers attached undercounter. This provided water outlet temperatures of 65, 75, 85 and 95 oC. To say that they were a resounding success would be an understatement. Both in terms of aesthetics and practicality they performed. For TEDGlobal we had space for only one uber font on the counter, and a counter top. The temperatures that we needed were again 65, 75, 85 and 95. 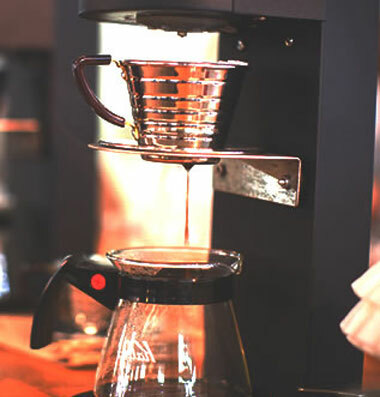 The 95 oC would be used by us as well as the coffee folk for brewing their filter coffee. It followed that the counter top would dispense 95oC water, as it was a 10 litre capacity. The temperatures of the eco boilers attached to the uber font would be 65 and 85 oC. When the temperature of 75oC was required we would mix both the 65 and 85 together by using the same font. This was done by weighing the water dispensed, which gave consistent results. The uber font enhanced the ‘art display’, and many delegates were in shock when they saw it dispense water. In my opinion one of the most important things in service is to catch peoples attention, and the uber when seen for the first time certainly does that. Huge thanks to Kasim for this and for all his work with Marco to date, he’s been brilliant. As for us; Paul is off to the Olympics today and Drewry has been over there for a few days now so expect to see some pictures floating around Twitter. We’re in the midst of deciding on what events to attend next year so we’ll shed some light on those soon enough. I’m not at the Olympics but I don’t mind. Seriously, I’m cool with it. Time to get some serious work done.